Are you seeking some career advice? Well, here is a site that can help you. 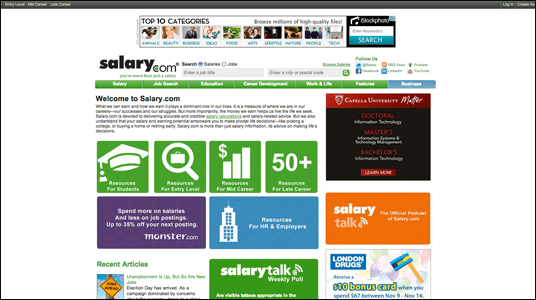 Salary.com has many little programs designed to help you with your career. Although the main job engine is focused solely on the United States, Salary.com’s many career applications can help everyone. Choose between their personal Salary Report, Salary Wizard Pro, Job Valuation Report, Career Archetype Test and the Salary Wizard Advanced Features. This site can help you plot your course if you are at the beginning of your career, the middle or even at the end of your Career journey. The Archetype test can help you evaluate if you are on the right path or what a good choice would be if you wanted to choose another career. Salary.com even has a fun how long will it take you to become a millionaire calculator. There is deffinatley a lot of worth while information packed into this site and it’s definitely worth exploring. This entry was posted on Tuesday, November 13th, 2012 at 2:31 amand is filed under . You can follow any responses to this entry through the RSS 2.0 feed. You can leave a response, or trackback from your own site.